This is for you Nicholas - thanks for watching my videos! My former preschool teacher is on a cross country road trip and she has been sharing photos of that trip. They stayed at a very nice American owned motel in OK and she gave me permission to share her photos with ya'll. This motel kind of has a neat feature that most hotels have gotten away from...Thanks Mrs. Ellen for sharing. It's neat to see places like this. Her statement about this place "Wish there were more than one of these - wonderful, homey, vintage place to stay, complete with actual keys kept in cubbyholes behind the front desk, the world's strongest shower, and the sweetest, friendliest staff you'd ever want to see. If you are ever in the area, stay here." Their info is located below & at end of video. 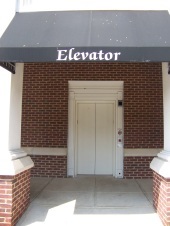 Wonder What Brand & Type of Elevator This New HIE Has?